A new builder aims for affordability and long-distance cruising. Attendees who stroll around boat shows will notice a sea (pun intended) of excellent powerboats on display. There are all sorts of different designs — fast, plush, compact and super-sized — but in general, they have one thing in common: they’re a significant financial obligation. Probably the second-biggest one most people will make. Noting this, SeaPiper designer and California resident Ritzo Muntinga set his sights on producing a durable, long-distance boat that would be easy to maintain and attainable for the average boater, even purchased new. Built in China, the new 35-footer is a no-nonsense vessel that will take its owners to places the others will, for less. The SeaPiper 35 is altogether a different kind of trawler, which I saw immediately from the dock. Like a crabbing trawler, its main outside space is amidships, abutted at the front by a sleeping cabin and head and aft by the pilothouse and galley. Farther aft is a compact cockpit with two seats. It has the hardy look of a boat that can wander far, and with a single diesel in the engine space, that’s pretty much true. The 60-squarefoot center cockpit, which houses a service winch, evokes thoughts of a workboat, but I can think of three positive reasons to have the main outdoor area in the middle. First, it’s the area on the boat with the least motion, so it’s comfortable even for folks who aren’t at ease on the sea. Second, it’s in full view of the pilothouse, so it can be monitored by the captain while underway, and its 30-inch coamings make it a safe area for small kids. Third, it sits low behind the forward accommodations and at anchor it’s protected. Side doors both port and starboard provide easy access from the dock, and from here passengers can go forward to stow clothes in the cabin or aft to pack provisions in the galley. These doors are also handy for boarding from a dinghy or as water access for swimming or diving, and the winch will make it easy to lift jerry cans or dive gear aboard. Bench seats along either side accommodate up to eight people for a gathering and also serve as steps up to the sidedecks, which lead to the bow. Here, a split anchor locker is accessible via two deck hatches, and the Maxwell RC8-8 electric windlass and the self-launching anchor roller will make light work of anchoring. Two 8-inch cleats are well placed to handle a snubber line or bridle, for extended periods at anchor. There’s also a collision bulkhead between the anchor locker and the forward cabin. Passengers who board via the aft swim platform will step in through transom doors whose reversing center post allows them to open inward or outward. Sliding doors open to two steps that lead down from the cockpit to the galley, which houses a two-burner LPG cooktop — no more running the genset just to make coffee — a 4.6-cubic-foot refrigerator, a single stainless steel sink and a microwave. Our test boat was equipped with the optional oven. There’s a 2,200-watt inverter to power the outlets and plenty of Corian countertop space atop which to prepare meals. 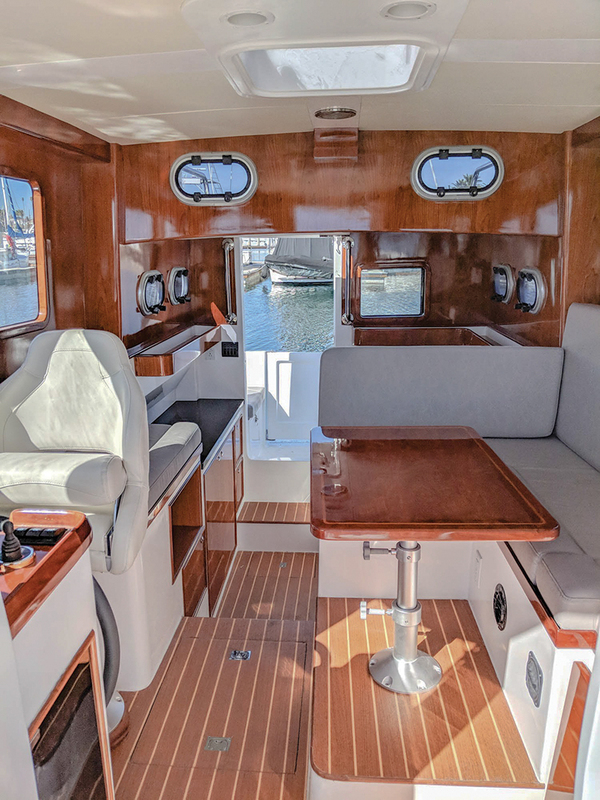 Three steps up is the pilothouse, which includes a four-person L-shaped dinette whose high/low table can be converted into a 6-foot, 6-inch-long single berth (or a really cozy double) for the occasional guest. 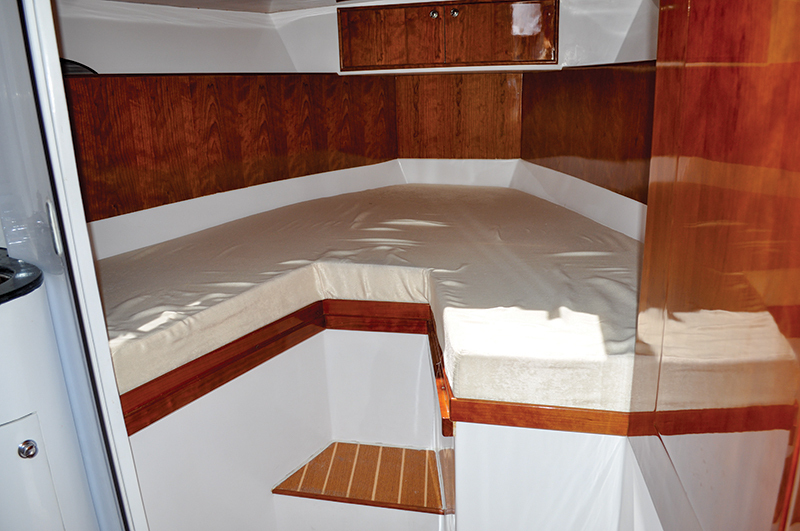 To starboard is an additional small settee and just ahead is the helm. It’s tucked into the corner and has space for an optional Raymarine electronics package installed on the dash. A destroyer wheel is mounted on the bulkhead and the steering is hydraulic. The finish here needs some rethinking, as does the space, which could use a more elegant layout for the electronics. Also, the helm seat needs a footrest the captain can use to steady himself in rough seas. A nice design feature is the inclusion of aft and forward doors. Open them both and the wind shoots through and cools down the space quickly, even if it’s been closed up and the sun has been beating through the surrounding windows. For ventilation underway, an overhead hatch and four opening portlights in the galley will draw air. The only cabin aboard is forward, separated from the rest of the interior and accessible via the mid-cockpit. There’s a nice V-berth forward, a hanging locker to starboard and a wet head with a Sealand electric macerating freshwater head to port. The freshwater head is an interesting choice on a vessel that is otherwise marked by its straightforward simplicity. The freshwater rinse will prevent odors from building up in the plumbing, but it will also be a draw on the freshwater supply, which is 140 gallons separated into three tanks. Add a water-maker, and it shouldn’t be a problem. 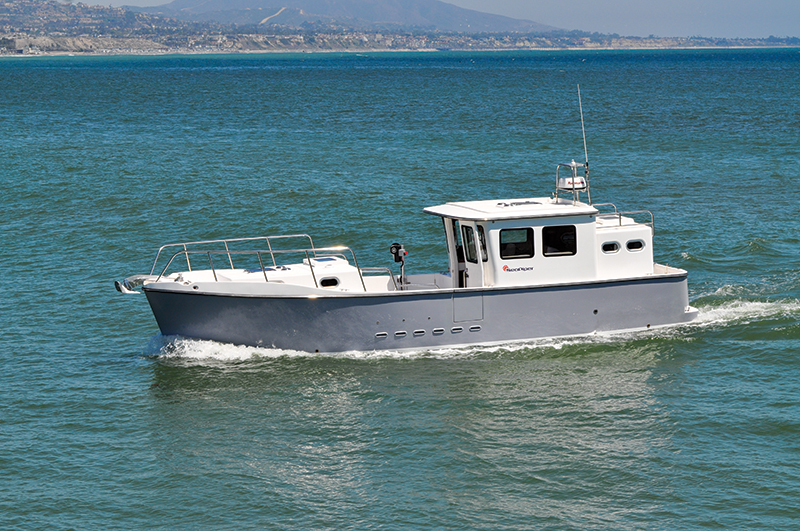 We tested hull #1 of the SeaPiper off the coast of Newport Beach in Southern California. Hull #2 is due for delivery in September and will include some minor tweaks. It’s great that the designer and builder are open to boater feedback, which will change the details in future hulls. It was a typical day on the Pacific, with a 1-foot chop and a light breeze from the northwest. With the 22-inch four-blade prop turning at 2350 rpm, we settled in at 8.6 knots. That’s a little faster than the boat’s best economy cruise, which is between 6.5 and 7 knots, where it burns 1 gph and has a nearly 2,000-mile range on 270 gallons of fuel. We’re talking sailboat efficiency here, and that’s nice, but pushing for just an extra knot of speed doubles the fuel burn. At wide-open throttle with four people aboard and half-filled tanks, the SeaPiper reached 9.8 knots at 2800 rpm. I found the boat a bit rolly when it was beam-to the swell, but not terribly so, and a Seakeeper gyrostabilizer is an option — there’s room built for it — for owners who want one. The single 85 hp Betamarine diesel is accessible via the cockpit sole just ahead of the pilothouse and also via interior floorboards. A ladder leads down from the cockpit to an engine room and auxiliary space that has good stowage capacity for additional systems, such as a water-maker. Onboard electrical is provided by four Group 31 house batteries, for a total of 420 amp hours, plus a separate engine starting battery that can be connected in parallel, if necessary. 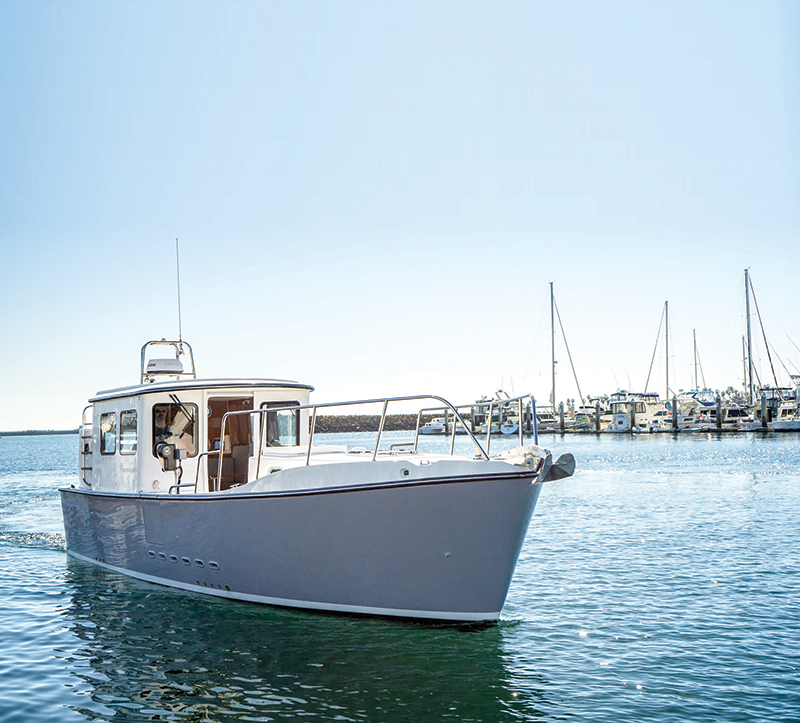 The diesel drives a 1¾-inch-thick stainless steel shaft that runs from amidships just about all the way aft and has a conventional shaft seal and cutlass bearing for easy DIY maintenance. Fuel is drawn in from wing tanks, each with its own fuel filter and deck fill. The SeaPiper has an easy way about it, running smoothly, turning gradually and generally behaving like a displacement vessel, which will be in the comfort zone for ex-sailors. A long keel keeps it tracking and will protect the prop and rudder in case of a beach grounding. Six watertight compartments have been added throughout the vessel for added safety. Visibility from the helm varies. Sightlines are good aft, and the captain can always keep an eye on what’s going on in the central cockpit ahead. I couldn’t quite see the bow, however, so docking or picking up a mooring will best be done by two people. Since the big prop kicks to port in reverse, the Vetus bow thruster helps immensely during backing maneuvers. Per the designer, another attractive feature of the SeaPiper is that it’s trailerable, so owners can choose to cruise both coastal and inland waters. For example, with the optional Espar forced air heater, the 35 will be a good Great Loop boat, and with its workboat aesthetic, it will be right a home in the Pacific Northwest. Given its 17,000- pound displacement, the 35 will likely need a super-duty truck — think F450 — as a tow vehicle. With solid FRP construction below the waterline and coring above, it’s not light for its size, but that’s likely to keep it more stable in snotty seas. The boat features a flat keel section that it can sit on and a highway-legal beam, so owners can take it from one cruising ground to another at 60 mph instead of at 8 knots, which opens a whole world of options. And of course, with a trailer, it can be stored on the hard instead of in the water when it’s not in use. The SeaPiper 35 is old school in its systems, which is refreshing in a world where everything is electronic and therefore more difficult to maintain. There’s really nothing on this boat that can’t be managed by an even minimally handy crew who are none too technical. A couple will be more than comfortable on long passages, and with ample stowage space both inside and out, they won’t have to leave much behind. Buyers looking for a flashy speedster won’t find the SeaPiper 35 to be right for them. It won’t plane or get to Catalina in less than an hour, and it won’t seat a big crowd for wild parties. But someone looking for a boat to cruise to Mexico singlehanded or a couple looking to travel up and down the coast will find it to be a good fit, not only for its range but also for its affordability. With $34,000 in added options, our test boat came in at $169,000. For a new boat, that’s a lot of bang for the buck. Draft: 2 ft., 11 in. Betamarine 85 hp diesel and TwinDisc transmission, 22-in. 4-blade prop, dripless shaft seal, LPG cooktop, Maxwell electric windlass, Sealand electric freshwater head and more. NextGen 3.5 kw diesel genset, Espar diesel forced air heating, Dometic air conditioning, raw-water washdown, utility winch, bow thruster, Raymarine electronics suite, oven upgrade, Seakeeper gyrostabilizer and more. SeaPiper, Aliso Viejo, Calif. (factory in China); seapiper.com. This entry was posted in Boat Tests New and tagged Trawler, new boat, seapiper, displacement hull by Stephanie Shibata. Bookmark the permalink. I love the SeaPiper and liked the article, great boat. Ugliest boat I have ever seen, and you may think it has a lot of good features, but I can’t see one other than the winch in the center for a work boat feature or to retrieve lobster pots . Somebody has got to kidding ? At first glance, this boat reminded me of the landing craft that I vectored into the beach in Vietnam when I was in the Navy in ‘65. Very innovative. I see this as a very good PacWest boat. Lots of possibilities. Is she the prettiest, nope, but who’s after pretty in an ocean boat. Hard to give any other opinion until we see some real world numbers though. I think she looks good, I plan on spending a ton of time on our new boat in Alaska country…. maybe she’d be a fit? She looks the part for sure. 35ft with a 102″ beam that makes it trailerable for under $170k-ingenious. They should sell a few boat loads. I’d like to see an option for a larger engine so to battle currents on rivers. Other than that, having a Diesel, genset, A/C, heat, Seakeeper, watermaker options are all good. A larger engine will do no good. It’s a displacement hull, your not going to go over 1.5X hull speed regardless of horsepower, all that will happen is the stern will settle down, the bow will rise toward the sky, and the boat will push a mountain of water ahead of it, and it will produce a big wake, which you will pay for in immense fuel consumption. You won’t see where your going, and you’ll gain virtually no speed. Physics at work. A true displacement hu ll won’t plane, but will provide remarkable efficiency when appropriately powered, which is the case here. My 24 sport fisherman burned 16 gallons per hour of 93 octane fuel, I wish I had this boat. I think the boat is a different take on a trawler that at least tries to be a little different and it has some nice features. However, there are a couple of things that I would change (in no particular order). Get rid of a lot of the interior wood. Wood accents are nice, but it’s too much in this boat IMO. There should be larger windows in the galley section instead of port lights (or at least bigger port lights). The aft part of the main cabin does not go with the front half aesthetically. The settee behind the helm chair seems like a waste of space or that someone could not think of anything to put there. Get rid of it and put a work space there or storage cabinets/compartments. Hopefully there is a way to have the cabin front door held partially open, rather than fully closed or fully open. It doesn’t look like there is any way to get air flowing through the cabin except by opening the door all the way. Perhaps the front side windows should be able to open. The window in the aft cabin door should be much bigger. If you use the side doors for boarding from a dinghy, there should be handholds there for that purpose. Also hull handles at the rear hull doors and swimstep. There definitely needs to be more room at the helm for equipment. IMO the space on the helm for the equipment should be FG instead of finished wood for ease of modifications. There doesn’t seem to a lot of external stowage space for lines, fenders, boat hooks, life rings, and all the other stuff you need to manage on the exterior of a boat. Since the steering is hydraulic there is no need for such a large helm wheel. A smaller wheel (mounted higher) would be a better fit in the cabin. The cabin windows can be made larger. It seems like the bottom edge can extend at about 6 inches lower than they are now. The price seems pretty good for a brand new boat. However, I hope that the low-ish price does not reflect the build quality such that in a few years things are going to start failing and the boat starts coming apart. All those fancy bits and pieces that make it look a bit overdone (IMO) can be points of failure. Like Ranger Tugs, they look nice when new, but how long does all that fancy finish stuff really last? P.S. Where do you put the dinghy? Stefan, big windows get punched out by big seas. Been there, no fun at all. Although a stern house is fairly well protected from this sort of thing I still don’t like to see big windows, they are just not appropriate for a true blue water boat. A well found boat is designed according to necessity rather than a flat lander’s sense of fashion, and such utilitarian design is itself beautiful. I can’t judge this boat without seeing it in person but for the money it certainly appears to be in the right direction, large scuppers and all. I just wish, for myself, it had a steel or aluminum mast installed so I could fly birds from outriggers (so much more reliable than a gyroscopic stabilizer, and also use no electricity). I imagine a mast could be added as a customization after purchase. With an 8 1/2 ft beam, it would best be aluminum and not terribly tall, a tree in fishing boat parlance, but that would work, and could look good. I think it looks great. So nice to see a company think outside the box and come up with some new ideas. These naysayers above probably don’t even own boats, they should put down their keyboards and get outside and have some real fun. Mr. Harben thank you for your service in Vietnam. Congrats to SeaPiper for a new innovative design, look forward to seeing one in person! As a matter of fact, I do own and sail a 1976 Fantasia35 sailboat berthed in the San Francisco Bay Area. Thanks for the note of appreciation. Adam, this isn’t a new design at all, it’s a very old design that should never have been forgotten by sport boat builders. The 22 inch wheel (ok, propeller for you flat landers) is ideal for efficiency – the boat probably has a 3/1 reduction gear. 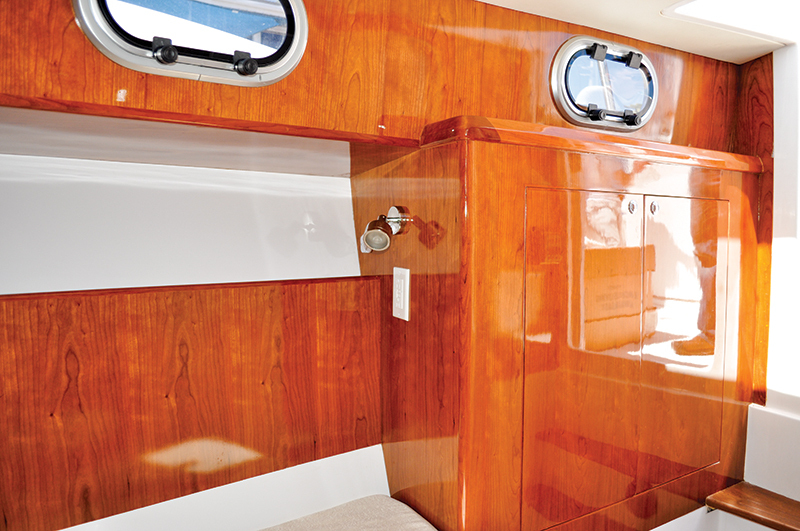 4/1 length to beam is as efficient as you’ll get in a 35′ boat. The design is basically the same as an old Eastern rig wooden fishing vessel. The boat is a beautiful blend of good looks and functionality. And brings fulltime liveaboard pricing in range with an underserved market. Would I change some things? Sure. Is there another boat out there that I wouldn’t? Nope. I just wish I could make it happen for me. I was privledged to take a ride on hull one this spring. As a motorcyclist, I compare it to the BMW GS1100. It is over engineered for reliability and ten other qualities that matter underway. Beauty is in the eye of the beholder, but working when it matters most is the most beautiful to me. Hull one is hull one, wait to see how quickly they incorporate improvements. I think this is the right boat for the times, but heck I just moved from a 3500 sf house to the 170 sf shack behind my rental as the first step in gettin’ me some Seapiper! PS: dingy davits are an extention of ‘roof rack’ rails above the rearmost cabin. The article stated 1 gallon per hour at 6.5 knots. I cannot believe that could be true of any 17000 lb vessel. I have an aluminum 10ft skiff with 30 hp outboard that probably burns that much at the same speed. As the website specs say, approx 2000 miles range with 270 gallon tank at 6.5 knots speed. of optimum streamlined shape for efficiency …. you know like a dolphin etc. even greater ranges and efficiency would be possible. Another point of clarification… Article said hull is solid FRP below waterline and cored above waterline..
in water soaking and spreading through the core which is the kiss of death for a lot of boats. Regardless…. I’d love to own one. I am a boater, right now sport fishing and having fun on the lake with the kids. Recently though I have been thinking of the next Chapter and have been inquiring a about trawlers. I cant even look at another boat after seeing this one. It Ticks all the boxes. Simple, Affordable, Trailerable, and safe. PRight on. Ticks all the boxes. Now let’s produce and scale it! A lot of Chinese manufacturers would love to produce this product. Moving the cockpit section forward a small distance(six inches) , will hardly reduce center section and will afford either increasing the rear area for better sitting and LPG storage or the dining/storage area. The larger engine will add weight and move center of gravity towards the aft and with a proper wheel, lower engine speeds will enhance performance and give a safety factor in higher speeds; a smart consideration in East coast cruising, where severe weather gives little time for decision making. Overall, the current design is quite adequate and it looks quite comfortable. I have been following the development of your boat and I really hope you will be successful, as I am thinking to buy one in the near future to use in Florida and the Bahamas. Good luck and please keep us better informed of your progress. Found this great vessel through the Nordhavn Dreamer’s site. Can’t wait to see her in person. This looks like an almost perfect boat for ICW East coast cruising with its less than 3’ draft and less than 9’ air clearance plus the beam makes it easily trainable. Now I know what it would look like if it was stretched another 10 feet. The Sea Piper looks like a great approach to long range motoring while coastal cruising/island hopping. Not the best hull form for open ocean.